SAN FRANCISCO (AP) — Apple co-founder Steve Wozniak had a front row seat as the personal computer began to reshape society. So it made perfect sense to him to bring a convention meshing technology with pop culture to Silicon Valley. The convergence will occur March 18-20 in San Jose, California, with the debut of Silicon Valley Comic Con. It's a new twist on an idea that has brought together fans of science fiction, fantasy and superheroes at packed shows held around the world for years. "I don't like doing the same thing as everyone else," Wozniak told The Associated Press Wednesday. So he teamed with four other partners to try something slightly different. The agenda includes a panel devoted to the quantum realm and an "app alley" featuring products from technology startups. The marquee attractions on the entertainment side include William Shatner from the original "Star Trek" and "Back To The Future" stars Michael J. Fox, Christopher Lloyd and Lea Thompson. "The emotions we have for technology now are the same as we get for movies, celebrities and the whole pop culture side of our lives," he said. That veneration of technology helped turn Wozniak's late partner, Steve Jobs, into an icon — and his October 2011 death into a worldwide wake. Wozniak himself has become better known through recent movies that retold the story of Jobs and Apple, as well as his guest appearances on TV shows such as "Dancing With The Stars" and "The Big Bang Theory." He now works at a Silicon Valley startup, Primary Data, and also spends about a third of the year on the road, mostly giving speeches and making other public appearances. "Everyone I go in the world, people just say, 'Thank you, thank you,' even if they don't happen to own an Apple product," Wozniak said. "They are just saying thank you for being a part of it all and want to show their love." He said that won't happen at Silicon Valley Comic Con, which has already sold enough tickets to turn a profit. Some tickets, which cost from $25 to $99, are still available, though a sold-out crowd of about 30,000 people is expected. "Ever since starting Apple, I have had the mentality that you should make a profit," Wozniak said. "That was Steve Jobs' big role (at Apple). He believed you start a company to make a profit because that is the only way you are going to go on to build other great things." 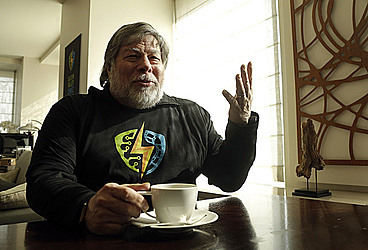 Jobs frowned upon Wozniak's involvement in the US Festivals and probably wouldn't have thought much of Silicon Valley Comic Con, according to Wozniak. "He would have been at it in his very early days, but people change and personalities settle in," Wozniak said. "He became more of the businessman taking the world forward with things like the Apple computer." Although Apple hasn't introduced another hit product since Jobs' death, Wozniak doesn't believe the company has lost the "innovation magic" that hatched the iPod, iPhone and iPad during the final decade of its late CEO's tenure. "Apple is in great shape to innovate for the next 200 years, just with their cash (totaling $216 billion)," he said. "That buys a lot of failure. One of the things about innovation is you have to risk failure." "A lot of science fiction starts out as a dream in your head where you go, 'Wow, that would be cool,' and then you have the actual technology people turn it into reality," Wozniak said. "That is the process of creation."